This particular project will be a little more difficult than some of the other projects involving photographs of the insides of buildings in East Liverpool. In this case the reason is that most of the pictures we have available to us are from ELHS Yearbooks. Naturally the focus of those pictures were the people in the picture rather than the space they were in. We will work with what we have and hope that over time pictures will turn up that do the inside of the building justice too. This will be ongoing as new pictures are added to this article. It is obvious that things were moved around in Central Building over the years. After the High School Building was built that continued. An example was the offices for Keramos and Keramos Echo. 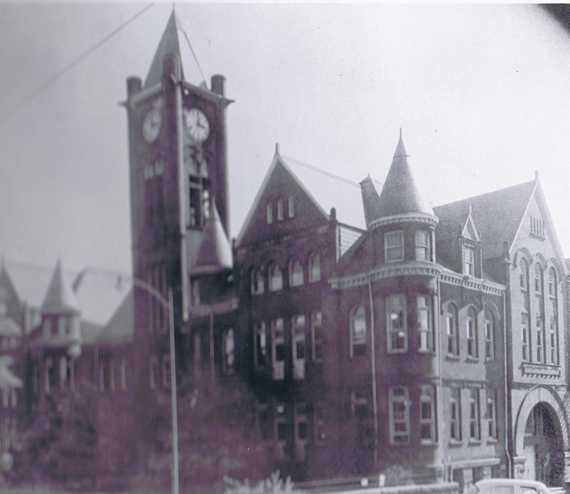 There was a period of time when the Keramos (yearbook) and the Keramos Echo (monthly newspaper) offices were located in the High School Building. 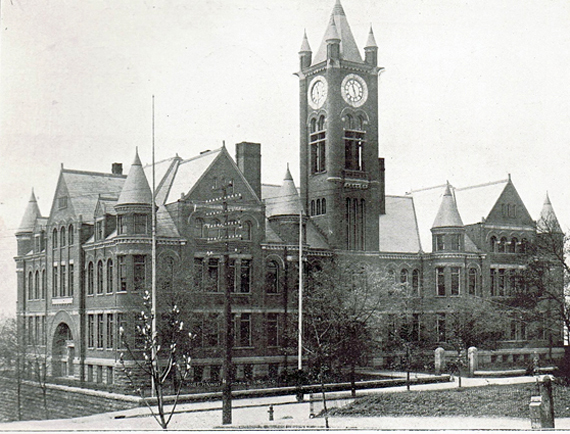 In the early 1960s they were located on the second floor of the Central Building. To an outsider our buildings seem ancient, void of any educational possibilities . . . but those of us who have learned in them, have learned from them that real quality in education is not based on appearance but on inner worth. (1968 Keramos, pg 5). 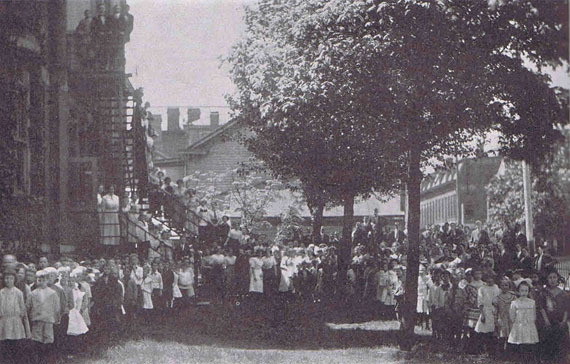 September 1895 Central School was dedicated. During the construction of Central the school students had been farmed out to temporary classrooms which had been rented in the city. 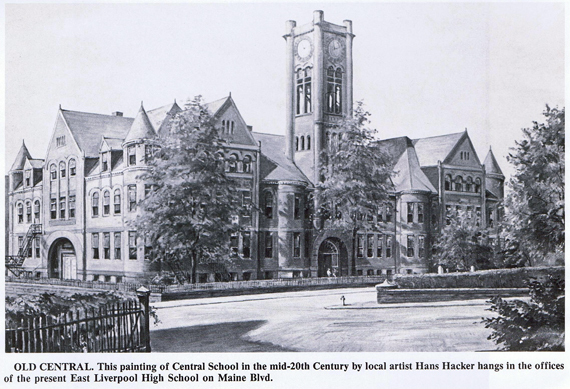 When Central opened there were 850 students in the building with about 50 in the high school class. There were 18 classrooms, a library, 2 recitation rooms, the superintendent's office and an office for the Board of Education. The cost of the building was $65,000. A magnet featuring an old photograph of Central School designed by Sarah Vodrey, Director of the Museum of Ceramics in ELO. A picture from a plane 1949 or 1950. It gives a good idea of the shape of the over all building. The building was 3 stories plus a full basement. The restrooms for the entire building were located in the basement. Also in the basement were some student lockers. The boiler room, coal storage and maintenance supplies and areas were also located in the basement. At one time in the 40s and perhaps earlier the metal shop was located in the basement. In the 50s it was moved to the Memorial Auditorium. At this point in time (Feb. 11, 2011) we are still unsure exactly how many rooms were located on the first and second floors but it appears that there were eight to ten rooms on the first and eight to ten rooms on the second floor. Some comments and facts on life at Central in the early years. From some of these comments you can learn a little more about the physical building. The Keramos was started in the 1909-10 school year. It was a high school paper published 6 times during the school year, November, December, January, February, March and May. These were bound together at the end of the year. It probably could be said that the six individual publications would be the forerunner of the Keramos Echo and perhaps the bound version the forerunner of the Yearbook Keramos.. We had hopes of finding the bound version of the 1910 Keramos since we knew it had 120 photographs, some of which were of the interior of the building (see picture from 1909 below) but were only able to locate the Vol. 1, May 1910, No. 6. It was on a bright September morn in the year 1910 when we, the class of '14, first made our appearance in this most inspiring and majestic temple of learning. The faces of our future instructors beamed with rays of knowledge as they gazed graciously on us, for the first time, a verdant, bewildered throng of the youths untried in the battle of life. All seemed new and strange about. We started out over a hundred strong and when a few of us got lost in what seemed a veritable labyrinth, Ah, me! how the older students (?) ridiculed us and looked wise. We know how they felt for have we not done the same thing since. After a few days, the newness wore off and we began to grasp the earnestness of the situation. The teachers gave us a clear understanding as to what we were here for. Why the office had been put at the end of the hall, and how we were expected to confide all our troubles to our "mother" confessor when we got a "pink slip" from class. We were all taught the inestimable value of a zero mark. When many other good and otherwise pointers had been given us, we were able to proceed with the business of the year. We started things going by organizing a High School orchestra, the first that a had ever been attempted in our school. Of course, we made a hit right away. Soon we had a "rep for being a bunch of musical boys." Incidentally we might also mention the girls, for we have several prima donnas in our midst. . . (MEMORIES P.V. Reinartz.'14. Keramos 1914). For a great many years the graduating class has been saying: "We are especially honored because we are the last to go from the old building." Every year the next class is thinking, "We shall be the first to enter the new building." But every time they have been deceived and both honors have been left for the best class, 1915. But then our class is one of distinction, so naturally that one must fall to us, too. Our distinction has sometimes been one of discredit according to some people, but that mostly happened in the old building and of course we have adopted the dignity worthy such a fine dwelling since we have entered it. And, too, our class is the only one left which had part in that canvassing of the town for votes on the school bond issue and we undoubtedly did our share, so this great honor is not unmerited. Sept. 4, 1911-My don't you remember that first day? Some came with their mammas and some came with their papas, but all came with their last year's report cards securely tucked away out of sight. Trembling and fearing the laugh of the Sophs we entered the High School, the High School which had been our goal for eight struggling years. Now we would realize our aims, our ideals! Surely now we were men and women. Oh what a welcome sight "Mother" Hallock was as she stood there at the foot of the stairs and directed us where to go. (I can't see how she always knew which were Freshmen.) Well do we remember those kind words of Miss Ikirt in her first (but by no means the last) lecture on "Advice to Freshmen." Sept. 5, 1911-Work had begun. We Freshmen submissively and becomingly kept to our own end of the hall. But yet it was so confusing. You couldn't blame "Sal" Smith when she went to algebra class instead of to Latin and several commercial students thought they could take arithmetic in Room 13 just as conveniently as in Room 2. Nov. 4-Rather late for hazing, wasn't it, Sophs ? And why did you pick on such a small lad as Leslie Jameson ? You should have at least gone outside of the building. You might have known the dark basement room was too near the janitor's room. (Keramos Vol. VI May 1915, No. 6). A picture taken from the Vol. III East Liverpool, Ohio December 1911, No. 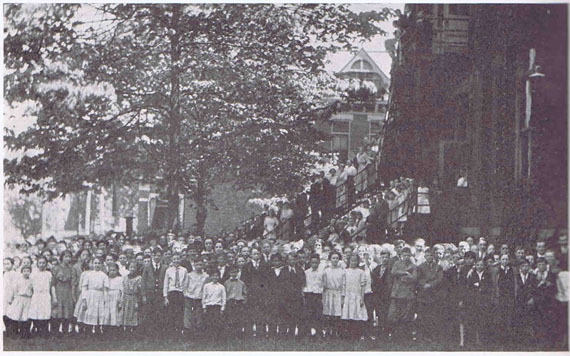 2 page 22 of Keramos shows high school students attending an assembly in 1909. 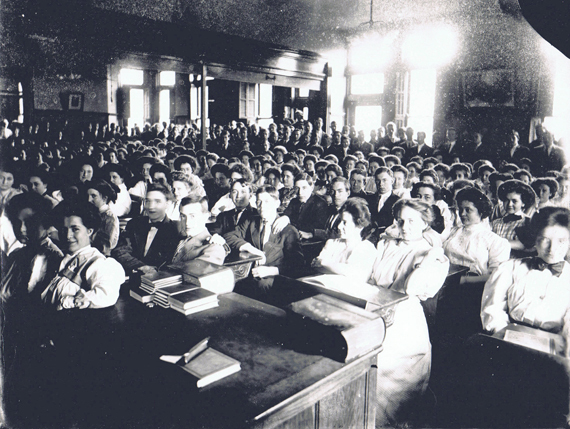 The Picture is captioned "High School Assembly Room in 1909". 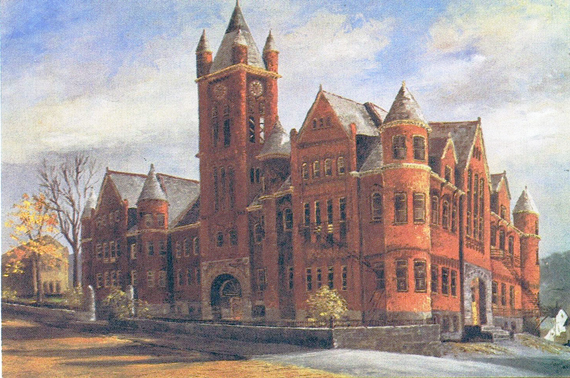 As the population of East Liverpool increased, the Central Building hall was subdivided and renovated to provide additional classroom space. We would like to credit Phil Rickerd of the Museum of Ceramics for finding this picture. In looking at the picture note that is appears to be two rooms with a wooden beam at the ceiling between them. Below the beam you can see a handle. That handle allows the pulling down of wooden slats which form a wooden blind that would separate the rooms making them two rooms instead of one overly large room. We have no way of knowing what floor this room is on. The question of a bond issue for a new High School building submitted to the voters at the last general election was defeated, and once more we must plod along content with the ancient facilities provided. Any fair-minded voter visiting our present quarters (we hesitate to say building), is at once convinced that a High School building is needed and needed soon after he has inspected all thoroughly, and then compares the facilities provided with those actually required by the work. The present building was never intended for High School purposes and can never be successfully used for such. Way down in the upper end of the basement are three rooms bearing the titles of Chemistry, Lecture Room, Chemistry Laboratory and Physics Laboratory. In the other end of the basement our Business Department holds forth. Sounds rather nice doesn't it? But do four common cellar rooms with a heater in each, damp, dark, ill-ventilated, and the work hindered by a lack of proper accommodations for the student, justify our titles? Often men well known and famed in connection with present day undertakings visit in our city. Such men are always glad to get an opportunity to speak to the High School students, yet we can not extend to them any such favor owing to the crowded, two-in-a-seat three - deep - around - the-walls, condition accessary in bringing the school together. Thus many opportunities of learning facts at educational value and meeting persons who hold high places in present day ovents are lost to us each year. If every voter could see the conditions under which Chapel exercises are conducted, it can be safely said that their ballot would be marked in favor of new conditions. We want the voters to see the conditions that exist. We want them to visit the school. Then we want them to ask themselves, if they think the amount asked for the erection of a new building is too large, or, is a new building not needed ? The answer is certain. It was through ignorance of existing conditions that the late bond issue failed. Let it be the duty of every High School student to see that the question when again submitted to the voters shall not fail. Some information that was learned from above was that the rooms were numbered differently in the early years. There was a office at the end of the hall but unfortunately which hall on which floor was not specified. The building was big enough and complicated enough kids got lost the first few days of school each year. Apparently some basement rooms were dark, though in looking at pictures of the building it appears as if there were a number of windows at the basement level as well as the other floors. Freshmen rooms were originally at one end of the second floor. With the opening of the High School building the following problem was eliminated: "There are no such things now as Sophomores standing around the wall in assembly and Freshmen being left out altogether." After a fire drill. A combination of High School and Elementary School students who attended Central Building. From Vol. III East Liverpool, Ohio May 1912, No. 6 Keramos. 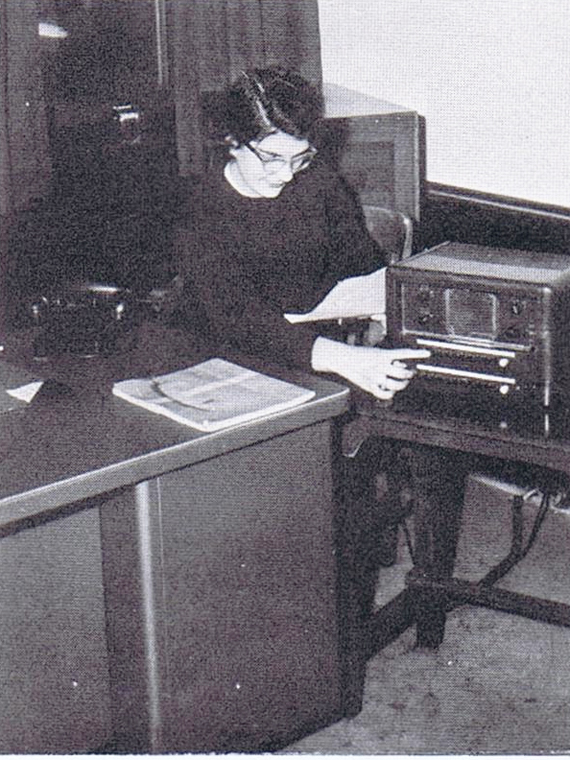 One of the efficient girls who worked in the Central Building office. We have been told that this office was to the left of the main entrance on the first floor. but but exactly where to the left the person couldn't recall. This is as close as we have come to a real floor plan of Central Building though even it isn't a true floor plan. However, it does shed some light on the layout of the building. This is from a 1923 Sandborn Fire Insurance Map. It sppears very likely that at least one of the offices would have been in one or the other of the two smaller rooms on either side of the main entrance. We know that originally there were at least two offices in Central Building. One for the Board of Education. One for the Superintendent. We know that one office was at the end of a hallway but not sure which office or which floor. 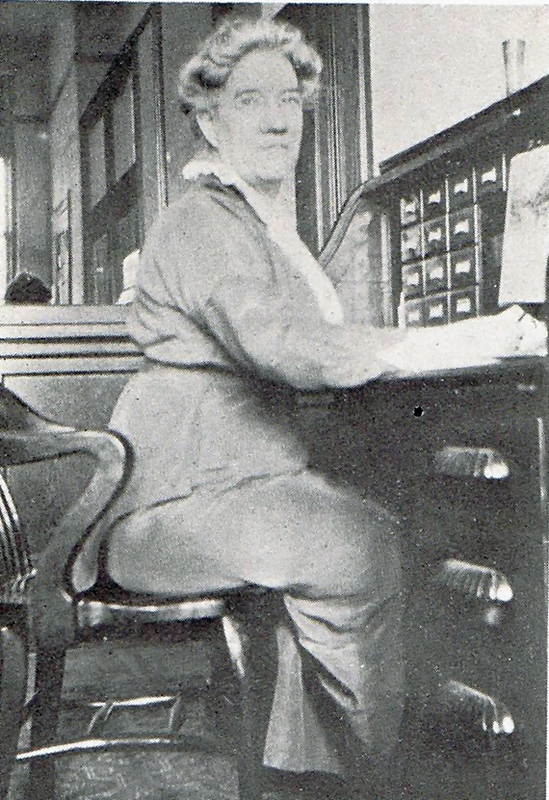 This picture shows Florence Updegraff, the Principle, in a office that appears may have been a shared office with maybe the Superintendent or BOE. 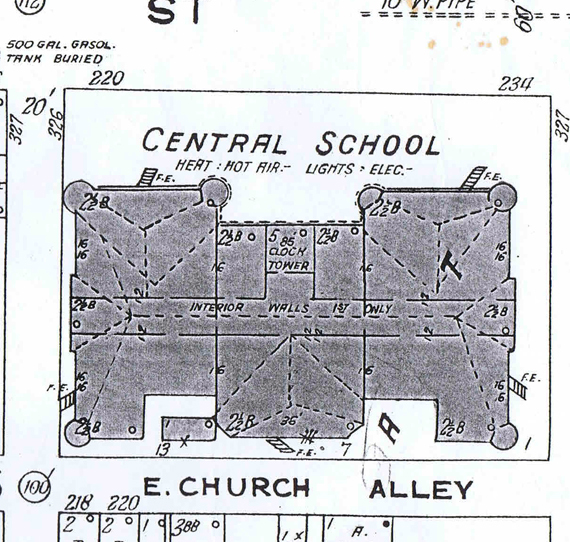 Prior to the building and opening of the High School building there would have had to have been space for the principal in Central Building as well as the BOE and Superintendent. The above diagram of the first floor is not to scale. However, it can give a good indication of the arrangements of the first floor of the building. It is based on memory and represents the best information we have presently. If anyone has a better recollection, please let us know. We will make any corrections needed. We would like this to be as accurate as possible. Top is south, right is west, bottom North, left East. The main hallway runs down the center of the first floor. On the south side, center, is the double staircase, the sets of stairs to the right and left running north and south are the stairs to the basement. This diagram was set up based on there being 8 rooms on the first floor. Emily Chipps February 24 at 10:29pm. I have looked at these pics several times. 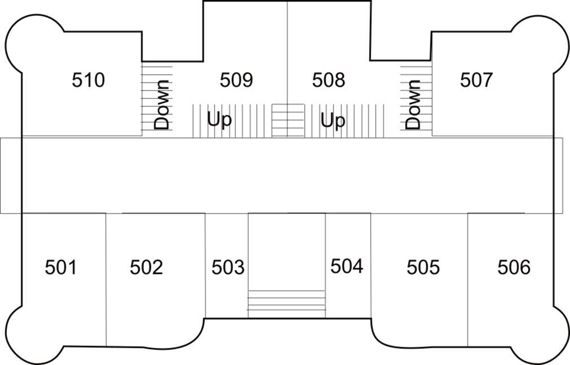 I do not remember too much about Central Bldg except I am positive where the diagram shows 1st floor front as being rooms 501, 502, 505 & 506 is wrong. There were three rooms on each side of entrance, 501, 502, 503 & 504, 505, 506. 503 & 504 were not used as classes and you could not access them from the hallway they kept the doors locked. you entered from 502 or 505. I had Art class 3 yrs in a row in room 505 and we used 504 for art supplies and special art projects. I assume 503 was accessed from 502 but was never in it so I don't know what it was used for. Maybe they didn't number them as rooms because they were only used for storage. These rooms were almost as big as the others. My home room sophmore yr was 2nd floor 601. I took drivers Ed. but don't remember which room. Also took world history sophmore yr. Wasn't Edna Clouses World history class in central bldg?. The original diagram was replaced with the current one. The current diagram is based on Emily's description. We still don't know where the small office was except to the left of the main entrance. Room 501. Mrs. Earl's Spanish class was on the NE corner of the first floor. Room 505. Mr. DeJulius. Drivers Education. Room 506. In the NW corner was Miss Lindsey's Latin class. There was a fire escape in her room that would take you out to the front of the building where the Alumnae Building now stands. Her front windows faced the library and the side window faced an alley. Room 508 As you entered the main doors, to your right under the main staircase was Miss Horger's 10th grade English class. Room 509 Mrs. Hissam, under Left Staircase south side of building. There may have been as many rooms on the second floor as there were on the first. There is at least one error in this diagram. The Keramos/Keramos Echo room and stairway to the third floor should be reversed on the diagram. The following information is based on the school year 1961-1962. Our nameless helper continues:. As for the stairs to the third floor. The stairs to the second floor did not continue on to the third floor. As I recall, next to the Keramos office there was a regular classroom door. When you opened that door there was a small hallway that led to the front of the building with a great view of the library. There was a set of stairs leading to the third floor. The stairs were beside the windows facing the library. So as you walked up the steps, you could see the street and the library. Next to the Keramos office (going EAST)there was a DOOR that you had to open to access the hallway that led to the stairs to the third floor. And yes, you can see those WINDOWS--(there were several huge windows) going to the third floor. I THINK the steps would be to the right of the Tower. I can't imagine a school that had steps to a third floor through a tower. There is still a little confusion. 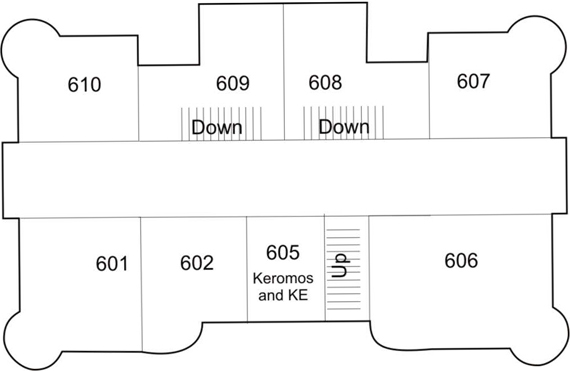 We aren't sure if the Keramos and Keramos Echo offices occupied rooms 602 and 605 or if both occupied just room 605. The importance would be in placing the hallway that led to the steps to the third floor. That hallway would be to the left of room 605 or to the left of room 602. The confusion arises from the following comment by our anonymous informant: "When you walked up the right side staircase--when you reached the top, if you made a sharp right hand turn, you would be at the door of the KE office (also Mr. Sayre's office). You had to walk into the KE office to reach the Keramos office." Room 606 Mrs. Poynter's speed reading was on the NW corner of the second floor directly above Miss Lindsey's Latin class. Room 607 Mr. Ira Sayre was the teacher in charge of the KE AND KERAMOS while I was a student. His English composition class was in a room on the SW corner of the Second Floor across the hall catty-corner from the KE office which was the room east of Mrs. Poynter's room. 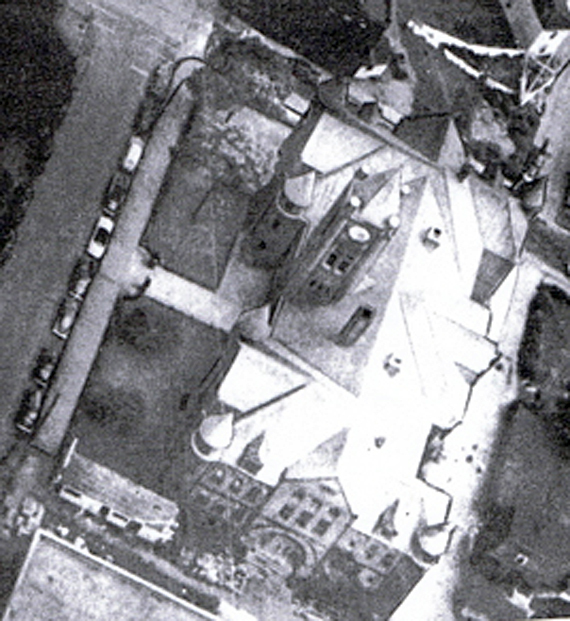 "The Keramos office and the Keramos Echo were during those years [school years 62, 63, 64] on the second floor of the Central Building. You would walk up the right side of the stairs from the first floor. Upon reaching the second floor--it was the doorway to your immediate right. There were two adjoining rooms facing the front of the building and library." "There were no stairs to the lower floor near the main entrance of Central. As you walked in those doors you would go either right or left past one classroom on the south side and you would find stairs to the lower floor and restrooms." "The two sets of stairs to the basement in Central were mirror images of each other--one on the SE side and one on the SW side of the first floor. As you walked down the stairs to the basement you were facing the river. As you walked up you would have been facing the library across the street." The stairs were sandwiched between the rooms on the SE and SW corners of the first floor and the rooms under the right and left sides of the double staircase on the first floor. "I remember OLD restrooms down those steps--the only restrooms in the building." We don't know if there were rooms 500, 600, 503, 504, 603, 604 or not. However, based on the fact that there were 4 fire escape doors each on the first and second floors connecting to four fire escapes, two at each end of the building, on the front of the building that tends to support the idea there were 8 rooms per floor. When I started playing in Band/Orchestra under Ralph Johnson in 1945-46, we rehearsed on that top floor of the old Central Building. The floors were creaky and, as I can recall, an oil soaked floor..I guess for cleaning purposes. There was a door at the far end that went out onto a fire escape..old and rusted..that went down to the alley BEHIND the building, so, it was quite a drop and we would all open the door and look down through the metal openings. Scary! The old Central Rehearsal areas were a disaster waiting to happen...you wondered if the floors would give way to the weight of the people up there or the noise of the instruments causing plaster to fall. We went over to the High School Building and did the concerts in the H.S. auditorium..not the M.A. Listening to the H.S. Band for the first time, for me, was at the High School Auditorium..cramped and uncomfortable for concerts. Chip Brookes, Class of 1947 pretty much agreed with what Vince Maola said above. He did add though that he felt that the steps to the third floor were in the tower section of the building directly above the main entrance on the second floor. He also said he recalled that the steps up into the tower was from the third floor. He said he remembered that the custodians had to go up inside the tower to wind the clock at times. He stated that the third floor was one huge room. Our thoughts to the above: The third floor still remains very much a mystery. As you look at pictures of Central Building there are a number of windows at the third floor level at each end of the building. None in the center. Almost as if two separate rooms. However, on the back side of the building the fire escape door or doors are located in the center of the building at the third floor level. That could indicate two rooms or if one huge room it seems like a lot of space for just band practice. Especially if one considers that ELHS may not have had a band in 1893-94 when the plans were being drawn up for the Central Building. If ELHS did have a band at that time it was a very small band. Surely that space was designed for more than just that.